« Pope Francis: Dublin Next To Host World Meeting of Families – Joke, Right? For those of us who find it difficult to concentrate, it might be helpful to use the Fatima Center online rosary – click here And note that you can skip the introductory music by clicking “skip”. Little Francisco, Fatima seer, really struggled with the rosary and had to have lots of pictures to help him concentrate. If you recall, Our Lady, answering Lucia’s question about whether they would go to Heaven, said “yes” but that Francisco would have to say many rosaries first. So difficulty in concentrating is no excuse not to pray the rosary – it’s an opportunity to find solutions, and the use of pictures and resources such as the online rosary at the Fatima Center, are helps to concentration. I too find it very difficult to concentrate when saying the rosary. I recently purchased a CD from the Dominican Sisters of Mary which has been quite helpful, although the nuns speak rather fast! I did find the online rosary helpful, so thanks Editor. I must admit that whenever I’ve read of Our Lady’s response to Lucia’s enquiry about Francisco going to heaven (‘Yes, but he must say many rosaries’), I always took it to mean that Francisco’s salvation was dependent upon his saying of many rosaries. I’m thinking now that Our Lady’s reply should be correctly interpreted as in effect saying ‘Yes, his salvation is assured but in the meantime, he should persevere, in spite of his difficulties, in saying many rosaries.’ Thinking of the first interpretation, if it was correct that only many rosaries would vouchsafe a chosen soul like Francisco’s entrance into heaven, then it really would be a narrow gate! Then again, I can’t help wondering (call it useless curiosity if you must) what would have been the consequences if Francisco had restricted himself to say, one rosary a day, given how difficult he found it to concentrate? Would his own salvation have been unaffected but the salvation of other souls put in jeopardy? You raise a very interesting point there, and it reminded me of the other Fatima “shocker” when Our Lady told Lucia about some young friends who had died, and gone to Heaven but one (can’t recall her name) would be in Purgatory until the end of time. I mean, a young girl? I quoted this once in the newsletter in the context of the forthcoming canonisations of Popes John Paul II and John XXIII, asking what on earth could have been so bad to have landed a young girl in Purgatory until the end of time, while two pontiffs who, between them, have all but destroyed the Church in my lifetime, are being pronounced saints in Heaven. I distinctly remember thinking “gerrourahere”! I think the answer has to be that we just do not know how God judges souls. I admit it, then, I’m just speculating – I don’t know any more than you do, although I’m more glamorous, more witty, more intelligent, more self-sacrificing, probably say many more rosaries than you do – oh, and am way more humble…. Now that’s what I call a comprehensive response! Thanks! I think the crucial point that you’ve brought to the fore (and which I didn’t know) was the childrens’ ‘abbreviated’ rosaries before the apparitions which goes a long way to explaining Our Lady’s advice for Francisco. As you also say, given his previous pattern of prayer, ‘many rosaries’ could equate to one each day as far as Francisco was concerned (although I think he along with the other seers prayed a great deal afterwards). Whilst on the subject of Fatima, one of the events in Jacinta’s life always stands out for me, namely how she had two ribs removed under local anaesthetic while being treated for pleurisy in hospital in Lisbon. Definitely a ‘living martyr’ like St.Isaac Jogues who, although safely back in France, returned to Canada as a missionary to the native tribes, despite having previously been subjected to torture with two of his fingers being chopped off. Anyway, your little list of attributes made me laugh but I have to quibble about one of them with four simple words: cream,meringue,elasticated,waistband. Self-sacrificing? Now that’s just a bit too much to swallow. You missed out the treble chin. That’s a really beautiful piece of music, Editor. Was that regularly heard in churches in the olden days? In my parish, where I grew up in the north of Glasgow, we often had the Ave Maria played on the organ during Communion plus Panis Angelicus. Beautiful. Actually, I wasn’t being cheeky. Not being of that generation I just wondered. My goodness, it’s a miracle that at my age I am here at all! You are absolutely right – I apologise for my flippancy. Yes. in the “olden days” when some of us were youngsters, we were blessed to hear beautiful music, such as the Ave Maria, in our churches. Beats “Bind us together, Lord” any day! Aw come on Ed! Try it – it’s much better if you sway to the music…. Recent press articles show how close this prophecy is to being fulfilled. Think that you can’t do anything about this? WRONG! Make the Morning Offering. Pray the Rosary every day without fail. Consecrate yourselves and your families to the Sacred Heart of Jesus and the Immaculate Heart of Mary. Be enrolled in and wear the Brown Scapular of Our Lady of Mount Carmel. Do the First Five Saturday devotion – as often as possible. The Rosary takes 20 minutes a day out of 24 hours, the First Saturdays takes less than two hours once a month. Nobody can have any excuse not to live the Fatima message. Also, get others to do these things – and never think that these things have little or no value, and couldn’t possibly help. Our efforts are nothing, but Our Lady has asked for them, and She will make them efficacious. Wishing you all a blessed month of the Rosary! I’ve sent that lovely poster to our webmaster to see if he can work on it so that I can include it in our next edition – we’re hoping to produce a short Synod Special edition to go out right after the “sham”. The inclusion of the poster will strike a note of hope, methinks. Thank you for posting the link. Thank you for that post about the First Saturdays. I keep being prevented from starting them but will definitely make a point of it soon. Thanks for that beautiful poster. I’ve often noticed how unsubscribed are comments to devotional threads. Thank you, Westminster Fly for that post. I might add that it is very reassuring to recall the words that Sister Lucia spoke to Father Fuentes in 1957. The power of the Rosary against the enemies of Christ has been demonstrated time and again throughout history. While in these of unprecedented crisis for the Church the enemy are busy inside the walls, it is well worth reposting the following examples of the power of the Rosary when directed against the enemy outside the walls in times past. It’s particularly appropriate to recall the great victory against the forces of Islam at Lepanto on 7 October 1571, obtained through Our Lady, as a result of Pope Saint Pius V calling on all Catholics to pray the Rosary. And what about the Soviet occupation of Austria after World War II? In 1948, tens of thousands of Austrians committed themselves to praying the Rosary every day until the Soviet forces left their country. In 1955, without any warning and without making any demands, the Soviets suddenly departed from eastern Austria. The date was May 13. While not related to direct combat against enemies of Christ, the following should further encourage people in these coming days to turn, with their Rosaries to the Immaculata, the scourge of all heresies? On the morning of 6 August, 1945, four Jesuit priests and four laymen were in the Church of Our Lady of the Assumption in the Japanese city of Hiroshima, praying the Rosary at the time the first atomic bomb was dropped. The centre of the nuclear explosion was only eight block away, yet none of the eight were killed, wounded, or even affected by radiation (even though 90% of the city was destroyed and 130,000 people were killed or wounded).Over 200 scientists examined these survivors during the following years, but no one had a medical or scientific explanation for their survival. Three days later after Hiroshima, 75,000 people were killed by a second atomic bomb dropped on Nagasaki. This time, a small group of Franciscan Friars happened to be at the centre of the explosion, and emerged unscathed. They attributed their safety to the fact that they were living the Fatima message of prayer and penance. That is a really very interesting post from you. I’m wondering if you can give me any links to the scientists who examined the priests at Hiroshima and Nagasaki, as I know when I tell these stories, I will be met with “how do you actually know this is true?” and so on and so forth. I have heard these events before but never been able to find any scientific sources which I’m sure must be out there. If you can help, that would be great. Everything in your post is important, and I love that quote from Sr Lucia about the rosary being given new power in these days. Thanks greatly for that inspiring post. I had another look just now on Google and found this eyewitness account from one of the priests and there are very interesting comments below about scientists who examined the priests. But I would like to find something on a science site. The fifteen promises of the Rosary given to Saint Dominic and Blessed Alan de la Roche should also provide us with all the incentive we need to find the time to say the daily Rosary. The magnification function, which is on the menu which is opened by clicking the icon with the three horizontal lines at the top right corner side of the opened file, will probably need to be used here. The text of the promises are a little hard to read but it can be done, so thank you for posting that beautiful picture with promises. 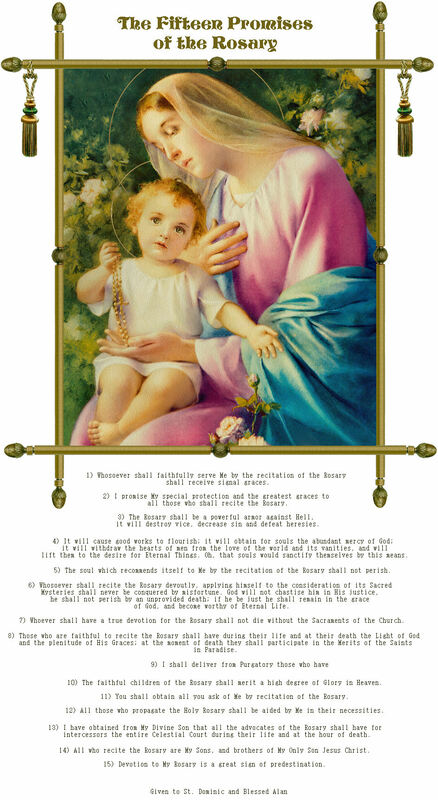 Maybe Specsavers could use the fifteen promises of the Rosary that I posted last evening for testing eyesight. The link itself was what I copied from Word on my computer, but for some reason it hit the blog as an opened file. Below is the link to the home page, from which readers can hopefully click onto “fifteen promises of the Rosary” link to get a better version. As I posted previously, the magnification function, which is on the menu which is opened by clicking the icon with the three horizontal lines at the top right corner side of the opened file, will probably need to be used anyway. It looks like there is a lot of other edifying Catholic material linked to this homepage. I know that Catholic Tradition site and at one time had an exchange of emails with the administrator when I saw that he/she had linked to our website, with a photo of St John Ogilvie. I’m sure it was that site. But when I checked just now, there is no link to us, but a link to the “Family, Tradition/Property” people – I’m a bit wary of them. That’s a fair question, Nicky. I will have to have a rummage, but off the top of my head, can’t think of any definite leads. It may be a while, but if I find the info I will definitely post it. Thanks for putting that video up. I didn’t seen any references to TNP. Your eyesight is obviously better than mine, or more likely, you read things more carefully. In fairness though, I have to say I have met some good lads from the TNP over here. There are serious disagreements with the Society of course and I understand your wariness, but credit where it is due. These guys in Dublin do have a lot more of the Church Militant spirit than most. They have a monthly public Rosary in the city’s main thoroughfare, usually with a set of bagpipes in operation! Before the Perversion Referendum in May, there was over one hundred people saying all fifteen mysteries of the Rosary. I don’t think I’m being a sneaky so-and-so if I say that nobody objected when Highland Cathedral was played at some stage. I know, I know. Anyway, it is a great tune. I didn’t mean to imply that the TFP (we don’t know them as TNP) are all bad. Not at all. Some of them here hold a public rosary for Scotland outside Parliament every 30 November to mark St Andrew’s Day but I just have some reservations. There will be a special NOVENA to Our Lady of Perpetual Succour in St. Peter’s Partick from Monday 19th October-Thursday 29th October (excluding Sat. & Sun) at 7.00pm. These nine evenings of prayer & Benediction will last 30minutes each night. Petition box will be available before devotions each evening. It is also hoped that an evening of Marian “Hymns of Praise” at St. Simon’s will be held during this month. Is there a car park at that Church in Glasgow? Also, do you know if the priest will lead the service or will it be a layperson? No car park I’m afraid but it is usually possible to find a space nearby. Hadn’t thought about who would be leading the rosary, though the priest, who has only been in post a couple of weeks, seems to have great devotion to Our Lady. It would have to be a priest for Benediction. You should be able to park easily in the street nearby, (for free) at that time. Also, the Church is very near Kelvinhall subway (5 mins) and reasonably near Partick train station and subway (10-15 mins). I’m not keen on the American version but I like the one we sing in the UK. Which one don’t you like? One of my most favourites is This is the Image of Our Queen. I haven’t heard it sung in donkeys years, except in my kitchen. that rose without a thorn. I’m wondering about this. You see if you can curtsey and twirl and survive falling over the hoover, you’re not as old as moi, so did you learn from one of those post-Vat II modified hymn-books? Interestingly those omitted lines referred to the Immaculate Conception and the H-word. Sad. I think that many of the hymns especially to Our Lady have been doctored as I noticed on a visit to local Cathedral once when they were singing from their newest up to date edition of the hymnal. I will take a closer look next time I go. Yet again, as with O Queen of the Holy Rosary, that is a totally different tune to that with which I grew up singing “This is the Image of Our Queen”. I am sorry – and no offence is intended – to say that I much prefer the tune(s) I learned in my youth. It seems I’m destined never to hear them again. I can’t find either on YouTube, and in our chapel, the people in charge of choosing the hymns seem to know the English versions. It’s disappointing. Dinnae worry Ed – I’d like to say I’m often disappointed when my favourite hymns are sung with an unfamiliar tune, but sadly I’m more often disappointed when I don’t hear them at all. I hope you appreciated my Scottish “dinnae” – said in a Glaswegian accent to boot. I thought of adding we’d just have to “thole” it, but thought I’d be pushing my luck…. Your accent is so convincing that I found myself thinking “I always thought Therese was English…” and then saw your hilarious concluding shot. By the way, did you see the cartoon inspired by one of your “climate change/green” posts, in the current (October) newsletter? Do you recognise this Glasgow version? Thanks for that, but the words are/were not the issue – it is the tune that is difficult to find. All over the internet, you will find the American version, which, no offence intended, I do not like as much as I like this version -which Vianney uncovered and posted below… It only plays one verse but it’s the correct tune, for which thank you again Vianney! I noticed on one of the other threads the Irish one that someone had found Lady of Knock.I personally really like it because you can’t get the tune out of your head although I don’t know that I would class this as a hymn.Does anyone else who knows it think that. I’ve copied it from the Ireland thread, where Michaela posted the video, as it’s most appropriate for this October thread as well. Let then the face of St.Bernadette, her eyes beaming with filial love, her whole face transfigured and lifted up to some high region of the soul, be a reminder to us that our Hail Marys should be words of love spoken to one who is a mother and who strains the ear to catch amid the medley of sounds one accent of true affection. A single Hail Mary thus said is better than a thousand glibly poured out to empty air. It is through the Rosary that we experience in the most special manner the motherly protection of Mary. Indeed, Our Lady seems to have appeared in Lourdes for the special purpose of persuading all men and women to say the Rosary. She becomes visible as soon as the Rosary begins; she holds the beads in her hands; she disappears when the Rosary ends. Let us always remember then that to say the Rosary is never merely to recite a prayer but is also to speak to a loving mother. Even if, in spite of effort, your prayer is full of dryness and distraction, it will be more meritorious than that of St.Bernadette. She basked in Our Lady’s glance and hung upon her smile; yours is the greater blessing due to those who have not seen and yet believe. Beautiful extract. I’m a little puzzled by the claim that Our Lady’s lips remained motionless during the recitation of the Rosary with Bernadette, however, because, during a pilgrimage to Lourdes, I remember one of the priests reading something to the effect that one of the things that convinced Bernadette’s priest of the truth of her visions, was her recounting that Our Lady prayed the Rosary with her, but only said the Our Father and Glory Be. Obviously, Bernadette is unlikely to have understood the significance of this – that Our Lady wouldn’t pray to herself ! So, either the Christian Brother who wrote the book got it wrong, or the priest on the pilgrimage got it wrong. I’m inclined to think the Christian Brother got it wrong – what do you think? You’re right (through gritted teeth) AGAIN. I too remember hearing that Our Lady did indeed say the Our Father and bowed her head while saying the Glory Be. In fairness to the Christian Brothers though, perhaps they were thinking specifically of the Hail Marys of each decade. Won’t you at least cut THEM some slack? Though I suspect even that would be elasticated so that they could be reined in in double quick time if the need arose! I’m all for acuracy….no, accurasy…..no, accurrissy……….ah, maybe just getting it right is better! The translator has embellished St Bernadette’s words methinks. This does not sound like the uneducated young girl she was. In the transcriots I have read of Berbadette’s accounts of the apparitions, she spoke very simply. As Henri Lasserre (a barrister whose sight had been restored at Lourdes) compiled his description as a result of several personal interviews with St.Bernadette after she had become a nun and aware (as I hope we are) of the saint’s truly heroic fidelity to the truth, the possibility that he used his own literate abilities to enhance St.Bernadette’s testimony is not of any importance. I doubt (hopefully!) that Our Lady would condemn jewellery, etc. as “human vanity” – there’s nothing wrong with making the most of our appearance (in my case, it’s an act of undiluted charity towards all who meet me!) So I suspect the (male) author added his own wee touch to that extent, at least! When a gal can pun like what you can, any usage of the normal accoutrements of vanity (I thought of that phrase all by myself!) really would be taking the gilding of the lily to an absurdly superfluous level. I wonder if any readers have heard of the following story from the beginning of the First World War. I thought it very apt in these days of extreme crisis when the Deposit of the Faith itself is being resolutely attacked. The Modernist tanks are right now rumbling through the streets of Rome. “The desperate situation prompted Gen. Joseph Gallieni, military governor of the French Army, to dispatch the emergency troop reinforcements by using a fleet of Parisian taxi cabs. In one night, some 600 taxis ferried approximately 6,000 French reserve infantry troops to the front. “Monument of Our Lady of the Marne, erected by Cardinal Marbeau after the War. Very apt indeed for these days. I also have to share something that I have just read this evening in an email sent to me by someone who is reading a book entitled, ‘Christians in China 600-2000 AD by Jean-Pierre Charbonniere, published by Ignatius. “A village (Donglu, 90 miles south of Beijing), with 700 Catholics & 9000 refugees, was attacked by 40,000 Boxers. Villagers had only 2 guns! Built earth ramparts and put up thorn bushes. It was all they had! Boxers attached 4 times & were repulsed. The Christians chased them shouting ‘Down with the Devil!’ Every evening priest brought Blessed Sacrament around rampart & women & children recited Rosary & Litany of Our Lady & called out ‘Salus Christianorum, Ora pro nobis! The Boxers eventually called in the Army. They sent several thousand troops with rifles & cannon. They attacked FORTY FOUR TIMES, but were repulsed, leaving rifles & cannon behind! Eventually they left. Only 16 Christians were killed, mostly from accidents with guns they didn’t know how to use. Some Boxers became Christians. They said what frightened them most was ‘The Lady in White ‘ who often appeared above the place. They saw this as a clear sign that anyone who entered would not get out alive. Two amazing, and most edifying stories. Many thanks for that. My 12 year old and 10 year old nephews will love those – I’ll copy and send your post in an email. They devour the lives of the saints and accounts of miracles like these, so thank you for that great post – yet another one! Thank you, Editor, but none of the credit is mine. I think you’ll like the following from the founder of the Marists, Father William Joseph Chaminade (1761-1850), who experienced at first-hand the evils of the satanic French Revolution. He knew very well, and promoted, the unique, all powerful role of Our Lady in crushing the head of the serpent and destroying all the enemies of the Church. It hardly needs saying that the following words of his, each and every one of them, are just as relevant today, and reiterate all the assurance any of us ever need. Beautiful quote – and very encouraging at this particular stage in this, the worst ever crisis to afflict the Church. BBC Radio Scotland’s Kaye Adams (phone-in) show is doing a special programme on the Named Person scheme live from Inverness on Wednesday morning between 9am and 12 noon. Please take this great opportunity to have your voice heard. The more people know about the Named Person scheme, the less they like it. Your contribution could make all the difference. NO2NP opposes the Scottish Government’s plan to assign a ‘Named Person’ to every child in Scotland because it undermines families and diverts resources away from children who need them. Editor, is this the version of O Queen of the Holy Rosary you meant? YES YES YES YES YES YES YES YES YES YES YES YES YES YES YES YES ! Grrrrrrr! I can just about read the music, and that’s the lovely version I know as well. Unfortunately the device I’m using doesn’t support whatever it needs to enable me to play it. Everything I tried when I googled this last week gave multiple u-tube renditions of the much less lovely American version. What a pity. Message to Nicky, if you are reading. You asked (October 2, 2.57pm) about links to medical evidence to back up the miraculous protection of the Jesuits at Hiroshima and the Franciscan Friars at Nagasaki. Unfortunately, I can’t help with this one. I read of these miraculous events some time back in a short (100 pages), entitled “Christian, Yes- But Why Catholic?”, by Father Joseph M. Esper. They were mentioned in chapter 24, The Power of the Rosary. Regrettably there is no footnote or citation for the scientific or medical evidence. Maybe somebody else can help us here. I agree that the scientific sources might be a bit of extra help in persuading skeptics (well, those of open minds and goodwill), but the bottom line is that these priests survived a catastrophic event. That’s the evidence to my way of thinking, and frankly I’m not sure what any doctor can add. It’s a different situation to one in which someone is inexplicably, in natural terms, cured from a disease. If a skeptic wants to prove that this is a hoax, that these men weren’t there, or were protected in some natural way, let them produce their evidence. I’m sure there would have been no shortage of helpers over the years. Thanks again, Nicky for the video which you posted. That’s a great answer to Nicky. It’s up to the doubters to prove nothing happened. Just as it is up to the atheists to prove there’s no God. Love it! “Nothing” is what rocks dream of, and that’s exactly what I expect to hear from skeptics regarding the Hiroshima and Nagasaki miracles, and from atheists when it comes to backing up their assault on reason. That is, indeed, a pearl of wisdom to answer any atheist. As is your quote from Chesterton on the same subject at 2.10 pm on October 6th. Thank you for both. I’ll make very good use of them! Two great quotes and ones which I also would hope to use in the future. There are two questions I always ask an atheist. Why are you always in a bad mood? And how do you explain how a non-existing being can cause natural calamities? Happy Feast of the Holy Rosary, everyone! I would appreciate your prayers today for a very special personal intention. Thank you. Oops Yes I will try to remember to add your special intention to my list Editor. Thank you for remembering my intention but Our Lady didn’t grant my intention, at least not as I more or less demanded it, now, this very day. A Blessed Feast of the Most Holy Rosary to everyone. Enjoy the meditations. I do miss all the hymns to Our Lady we learnt at school. I think I’ve mentioned before that we don’t have very much hymn singing in the SSPX church I attend and when they do sing a hymn, I know, it is often the ‘wrong’ tune! Am I right in saying that ‘in the old days’ we used to have hymns throughout the Mass as well as the Latin sung Mass and especially during Holy Communion. There were so many communicants that there was more than one hymn sung then. They were all so meaningful too. I loved Hail Queen of Heaven too, Hail Thou, Star of Ocean, and I’ll sing a Hymn to Mary. Does anyone remember Daily, Daily, Sing to Mary. If I knew how to post them I would so will have to get to grips with that. There are 2 versions of Daily Daily Sing to Mary, but neither one is the “right” tune! It’s not the “right” one Vianney, but I must say it’s also nice so I can live with that! I remember hearing a man from Rhodesia who told us that when there were the troubles and people were frequently being attacked and murdered in their cars, he and other families who were travelling in convoys to and from Mass would sing Daily, Daily Sing to Mary all along the way to keep them protected. It worked. This is the only tune I know. perhaps the one you remember will turn up. Thanks for that. I dug out our thread for the Feast of the Assumption, which led with a video of I’ll Sing a Hymn to Mary, sung by a Fr Francis. I’m putting the link here because, again, I think some of the words in the version you’ve posted are slightly different from the one with which I grew up and the one with which I grew up is always the “correct” version! Seriously… I’d copied the words underneath Fr Francis’ video, so it’s easy to check if we are all, as they love to say these days, singing from the same hymn sheet or (as seems to be more usual these days) not! The gate of Heav’n to me. Words of the hymns seem to change from country to country. Comparing the words of some hymns in the St. Andrew Hymnal to the same one in the Westminster Hymnal often show differences. In England there was also the Leeds Catholic Hymnal and often the words were slightly different from those in the Westminster. The black hymnal used in some SSPX chapels comes from Australia and, again, words can be different, in fact, I heard recently that in one chapel in England the people refuse to use the Black hymnal because the words are different from what they know. Let’s face it, if you are a Traditionalists then that goes for hymns too. There were some minor differences from the (correct!) version with which I grew up, “yours” where “thee” and “thou” used to be, but, that said, that is a lovely version. That’s great Editor – I was only listening to the tune, not the words, and much prefer “thee” and “thou”. I’ve noticed that I’m in the minority now when I recite the Rosary and the Our Father with the “thee’s” and “thou’s”! Yes there was always a hymn at holy communion.It is quite sad save from the end of mass hymn occasionally that hymns have disappeared during mass.Even with the end of hymn mass I think someone made the point previously it is always restricted to the usual one or two same hymns when there are abundance of beautiful hymns that we all know could be sung. I agree. I remember somebody saying we could buy the old hymns on CD but where? Also, how can we be sure they’re tunes we know and not American or English tunes? Does anybody know? We are very lucky in that we sing a great variety of hymns. Yes, you do have a great variety of hymns over there in Edinburgh. It’s just a pity you lot can’t sing! Oh dear Editor, and there was me going to ask the choir mistress if you could join the choir. There are a lot more communicants now than ‘in the old days’. In the ‘(g)olden days’ people didn’t receive communion unless they felt they were in a state of grace and that meant having been to confession within the previous few weeks. Even having taken a drink of water after twelve the previous night would have been enough to stop someone from receiving. Well, it shouldn’t since water was allowed at any time. I’ve heard that before and it really irks me because it’s that sort of mistake by ignorant laity that brings unwarranted criticism on the Church. That’s a bit hard Ed! An awful lot of us were ignorant of this in the good old days. Most of us thought that fasting from midnight meant not even having water, and someone always fainted during Mass! Apologies – in that case, you were not given a fair deal by your priest(s). I distinctly remember being taught, prior to First Communion, that the one thing we could take right up to the last minute, so to speak, was water. I’m always amazed that some people were NOT taught that. Anyway, nobody could accuse YOU of being ignorant laity, Christina, so my humble apologies – with bells on. I could never think badly of you. You’ll always be my friend – you know too much … ! I don’t even remember my first communion never mind what was taught before it. Editor, Frankier and Clothilde are correct. I remember that, on the morning of my First Holy Communion, a girl put her mouth under the tap in the playground, and she was sent home! Fact. She had to wait until the following year. I recall from previous discussions on this that Canon Law (1917) required an absolute fast from food and drink from midnight for those over 21 although not sure if any modifications were brought in (I think there was a motu proprio on the subject at the time of Pius XII, but can’t recall details.) Anyway, Canon Law, 1917 code addressed fasting for those over 21 until about 60-ish. I was only seven when I made my First Communion. I know that we were permitted water and I remember clearly that that permission lasted (in my parish at least!) until the new three hour fast was introduced. We were frequently reminded of the fasting rules by our, at that time, very strict parish priest, now, undoubtedly, looking down in horror at what is going on around us. And I don’t mean the fasting law. What they did in your parish or Frankier’s parish or Clothilde’s parish, I haven’t a clue. But I know what I was taught and to this day I take a glass of water before leaving for Mass. Water and medicine were the exceptions to the fasting rule – I had that drummed into me from my preparation for First Holy Communion days. That’s what I was taught also, Editor. Why’s poor Clothilde being blamed for wot I sed? What do you mean by “mixed up AGAIN”? Sorry Clothilde for my error. And again, we were taught NOT to drink water before Holy Communion. Fact! Well, if you were taught that at a time when the 1917 Code of Canon Law was in force, and you were under 21, you were taught the wrong thing. Whoever enforced the strict fast on anyone under 21 and over 60, was disobeying Canon Law. As it happens, I managed to get into town to Mass this evening and afterwards cornered a lady who was in the same parish in which I grew up, at the same time. We knew each other in our youth. I asked her if she could remember what we were taught about the fasting from midnight rule. She looked puzzled, so I added “was there any exception to the fast?” And she replied immediately “only water”. Then when I said “medicine, as well?” She added, yes, water and medicine. If I were to tell you what I think of that Elvis Hail Mary, I’d be banned from this blog for life ! I knew you’d like it Editor. Lol. Aw well, I think it’s sweet; yes, it’s not “Catholic”, but I’m glad that a non-Catholic would sing such a heartfelt song to Our Blessed Lady. Poor Elvis. I will now retreat behind the sofa with my hard hat on and with a G&T to await the fall-out. Poor Elvis indeed. May his soul rest in peace. I enjoyed listening to it although I wouldn’t want to hear it in church. I think his heart was in the right place and I’m sure Our Lady was pleased with it. Come back Amazing Grace – all is forgiven. To say the least! Priceless, Christina! LOL! I agree! The Elvis song is terrible! Christina, Yes thanks for sticking up for me. I might look weak but there’s good stuff in little parcels. I didn’t mind the Elvis song and video. On the water before Mass topic- My sister used to faint regularly and we were taught that we could take water before Holy Communion. Thanks Theresa for the lovely hymns and videos. Crofterlady, Seen as how its you I’ll forgive you this once! Error; I should have said that we were not allowed to drink water before receiving Holy Communion in the good old (obviously sometimes bad)days. Read my reply to Crofterlady just posted – in the days when the 1917 Code of Canon Law was in force, if you were taught you couldn’t drink water as an exception to the midnight fast rule, and you were under 21 or over 60, then you were taught the wrong thing. Sorry about this, Ed, and even sorrier because I know I’ll fall off the pay-scale for ever 😥 but I must come back to that Eucharistic fast argument. I couldn’t accept that the many priests and teachers responsible for my religious education could all make such a mistake about the fast (that it included fasting from water). Teachers were subjected to ‘religious inspections’, by priests, of their classroom teaching of the faith, and, believe me, no mistakes such as one about the Eucharistic fast would be tolerated. The 1917 Code of Canon Law, Canon 858:1. simply says “Whoever has not observed a natural fast from midnight cannot be admitted to the most Holy Eucharist…”. Exceptions follow, but water is not mentioned. A natural fast (see the teaching of the Council of Trent on the Eucharistic fast) is fasting from all foods and liquids including water, just as it had been practised through the ages in the universal discipline of the Latin Church. Commenting on the rule as it appears in the 1917 Code, Fr. Peter Carota says: ” From the 1917 Code of Canon Law we have the fasting rule of nothing, water, liquids or foods from midnight”. I think the confusion has arisen because of Pope Pius XII’s Apostolic Constitution ‘Christus Dominus’ (1953) in which he decreed that fasting from midnight was to be retained, but that natural water did not now break the fast. Other changes followed thick and fast, but that’s another (sad) story. With all due respect, I think the confusion has arisen because the fact that there is an age specified for the absolute fast is being overlooked by those of you who keep arguing that nobody was permitted to drink water at the time when we were required to fast from midnight. The fact is that the 1917 Code of Canon Law states that the fast which included water, applies to those who are over 21 and under 60. I was 7 when I made my First Communion, and so the law did not apply to me, or to any other 7 year olds at that time. Canon 1254. 1. The law of abstinence binds all those who have completed seven years of age. 2. All those are bound by the law of fast from the completion of the twenty-first year of age until the beginning of the sixtieth. Since I made my First Holy Communion some time after 1953, then, that relaxation, in addition to the age-limit of the 1917 Code of Canon Law, explains why my memory is very clear and absolutely correct, that we were – legitimately – taught that water and medicine were the exceptions to the strict fasting from midnight rule. And thank goodness for that; enough of us felt sick and had to go to the back, to the church porch for a glass of …. water to prevent us from fainting. Anyway, I hope we can agree that there has been some confusion or misunderstanding here, which we have now cleared up – not least because of your information about the 1953 permission from Pius XII to add natural water to the fasting exceptions in force in the 1917 Code. With due respect also, my point was and is that the Eucharistic fast, as prescribed in the 1917 Code was defined as a ‘natural fast’, and included fasting from water. Fact. In the various posts above it seemed to me that it was stated and understood by more than one blogger that the 1917 Code allowed water, and my intention was to correct that error. After 1953 that rule was modified and water was allowed. So if one received religious instruction before 1953 one was taught that the Eucharistic fast was total fasting from all food and drink, but if after 1953 one was taught that water was allowed. That is the point I was trying to make – just to show that we were probably all right! The thing is that the over 21 and under 60 fasting law was not mentioned in our instruction on the Holy Eucharist. I presume this is because we were being educated for life as adult Catholics? Is it not logical to conclude that, as we 7 year olds were not bound to fast, we could, both before and after 1953 have had the full English (or Scottish? Scotch? Scots?) breakfast – the whole nine yards – before going to Holy Communion? In fact one will not find anything to elaborate on what children were expected to do until in Christus Dominus one reads, in regard to late Masses and people in ‘particular circumstances’ which include: “…children for whom it is difficult to go to church, receive Holy Communion, then return home for breakfast then go to school, for whom even the first Mass of the morning is relatively late…”. So regardless of the law, children, by devout custom, were expected to fast like adults – which we all did – you with your water and me without. The fact that children were exempt from the fasting law is really irrelevant here. I realise now that – since at 7 years of age we were not taught the sources of the rules we were given – I was clearly a beneficiary, so to speak of the 1953 permission for water. It did not occur to me that there was any such additional document, all I knew was that I was taught very clearly that we had to fast, yes, but not from water. That’s the point I originally tried to make and the rest is, as they say, history! Sorry for any confusion which resulted from my misrepresenting of the “over 21” rule. I have just been reading where a young girl from Berwick is missing, presumably in Scotland. She left home in her car in the early hours of Thursday and hasn`t contacted her family since. She has a young son who is obviously missing her. I can`t imagine what her family must be suffering. It takes only a minute to recite the Our Father, three Hail Marys and a Gloria. In this month of the Holy Rosary can I ask for a minute of your time to recite these three prayers for this poor wee soul`s safe return home. Certainly Frankier. I will do so at once. Thanks, Frankier. I haven’t seen the news today but that is very worrying and of course I will include the missing girl in my prayers for what they are worth. I will pray also for an end to The Holocaust, capitals intended, that doesn’t get the same publicity as those of the past. A friend once related to a group of us how the Rosary had been of great help to him in a time of difficulty. Ill health was causing a great deal of distress in this life and was impacting on his ability to continue working as he had been. His employers were reluctant to retain him as he was no longer able to keep up with the work. One evening, towards the end of the family rosary, the doorbell rang, and standing on the doorstep was an acquaintance who had heard of his trouble and was in a position to help him retain his job and get back on his feet. My friend credits Our Lady of the Rosary with saving his livelihood and his family. I see that the young missing girl has been found safe and well. It’s nice to hear of some good news once in a while. That is great news, Frankier. I agree, we don’t get enough good news. The news from the Life News site is encouraging when celebrities come out and speak the truth and are not afraid to broadcast it with a t-shirt slogan. God Bless the man. Editor. Thanks for the above link. Scandalous language from the prominent pro-aborts which shows how the whole business in evil to the core. The dvd ‘Our Lady of Good Success – History. miracles, and prophecies’ explaining the apparitions of our Lady in Quito Eduador, will be shown in the parish hall [Sunday 11th October] evening starting at 7.30pm. A buffet supper will be available from 7.15pm. Tea and coffee will be served after the film. NOTE: for reasons beyond his control, Father was unable to let us view the Quito DVD. Instead, we viewed a video of the story of St Nicholas Owen, famed for creating the secret places for priests to hide when hunted during the Reformation. The video of Our Lady of Good Success will be shown next Sunday instead. All welcome. This photo is of the Fatima Center people handing out rosaries during their procession at the last synod, not this one which is what I thought at first, but I think it’s a great photo and might remind us to pray for the synod, on the eve of the anniversary of the miracle of the sun, tomorrow, 13th. I think I’ve met that lady giving out the rosaries! If she is who I think she is, she’s a very apostolic soul. Lovely photo.